The nose has thick-cut orange marmalade, apples, bananas, and then hints of nutmeg and cloves. The mouthfeel is decent, with a little cling. The body has oranges, pineapples, green apples, cloves, ginger and eucalyptus. The finish has ginger, oranges and eucalyptus. Water brings out thin, lazily expanding whorling that gradually settles into brief mottling. The nose gains more pineapple and loses the bananas. The body gains more pineapple and ginger, with nutmeg and cloves. The finish gains even more ginger. 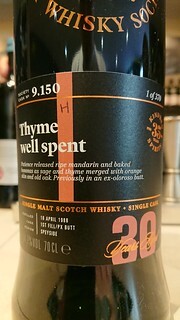 A dram which has everything going for it, then loads up on spicey notes a bit too much for me - a pity as it has a great balance and lots of other flavours to offer. Personal preference: Just the one dram, thanks. This whisky was provided by the SMWS in a preview session - thanks to them for that. Full editorial control has been retained in the tasting process! SMWS Outturn 269 - Up, up and away!